You will probably like this game if you like Lines. 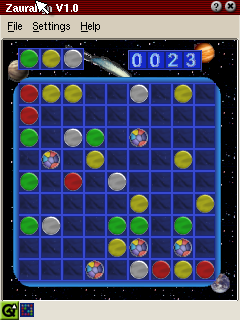 In this game you have to keep a game board free, fighting against new pieces appearing every move and clutter the board. In this respect it is in the category of Tetris like games. Pieces are removed by aligning pieces of the same colour in a row, column or diagonal. If you have aligned enough pieces (variable) they will vanish making more room on the board. To achieve this you can move any pieces to any location on the board which can be reached by moving the piece on a connected path horizontally or vertically or both. However, for each piece you move new pieces will drop onto the board (variable). Only if you manage to align enough pieces so that they vanish no new pieces will appear. There is also a joker piece which can be aligned with any colour. Zauralign is an cool boardgame which is highly addictive as it keeps you playing beating the highscores. Variable levels make it suitable for beginners and experienced players alike. 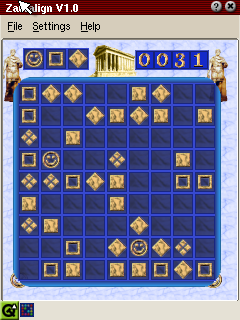 Although, the game just extends the old Lines games principle, the excellent graphics and the configurable themes promote it beyond the standard Lines games family.